Vigorous growing and with good foliage. Large open semi-double flowers of a deep purplish-pink. Strongly scented. Large, rounded, orange-red hips follow. Disease resistant. 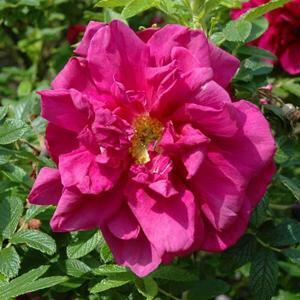 Best in fertile, moist, well drained soil in an open sunny position but tolerant of a range of conditions including poor soils. Thrives in coastal locations.